Sustainable Regeneration of Former Military Sites is the first book to analyze a profound land use change happening all over the world: the search for sustainable futures for property formerly dedicated to national defense now becoming redundant, disposed of and redeveloped. The new military necessity for rapid flexible response requires quite different physical resources from the massive fixed positions of the Cold War, with huge tracts of land and buildings looking for new uses. The transition from military to civilian life for these complex, contaminated, isolated, heritage laden and often contested sites in locations ranging from urban to remote is far from easy. There is very little systematic analysis of what follows base closures, leaving communities, governments, developers, and planners experimenting with untested land use configurations, partnership structures, and financing strategies. 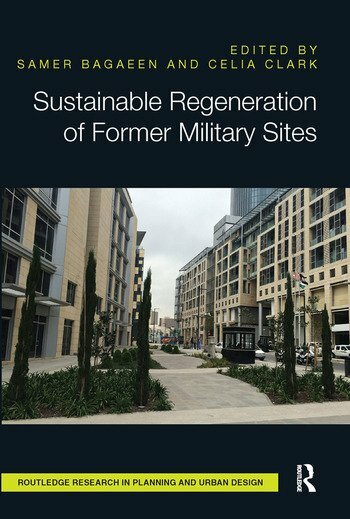 With twelve case studies drawn from different countries, many written by those involved, Sustainable Regeneration of Former Military Sites enables the diverse stakeholders in these projects to discover unique opportunities for reuse and learn from others’ experiences of successful regeneration. Samer Bagaeen (www.samerbagaeen.com) is a leading practitioner and educator based in the United Kingdom. He leads on town planning education at the University of Brighton and is Visiting Professor of Real Estate at the Institute of Urban Economy in Lima, Peru. He was invited in 2012 into eminent Fellowship of the Royal Institution of Chartered Surveyors and in 2013 was invited to join the Academy of Urbanism as an Academician. He recently co-edited Beyond Gated Communities (Routledge, 2015). His other research interests lie in the areas of real estate development and tourism and his publications in this field include ‘Saudi Arabia, Bahrain, United Arab Emirates and Qatar: Middle Eastern complexity and contradiction’ in G. Squires and E. Heurkens (eds) International Approaches to Real Estate Development (Routledge 2015); and ‘Tourism Development in Bahrain: Dealing with Change’ in M. Stephenson and A. al-Hamarneh (eds) International Tourism and the Gulf Cooperation Council States (Routledge 2016). Samer is a Fellow of the Royal Society of Arts and a Trustee of two leading urban planning organisations in London, the Town and Country Planning Association and the Royal Town Planning Institute. Celia Clark (www.celiaclark.co.uk) has documented the transition of former defence sites to civilian uses in different parts of the world since the 1990s. She initiated a series of regional seminars and international conferences for planners and built environment professionals, academics, local governments and formerly defence dependent communities to share experience and good practice in these unusual land use transfers, with their myriads of stakeholders. She helped found the Naval Dockyards Society in 1997 (http://navaldockyards.org). She put together the bid to inscribe Portsmouth Harbour, the Isle of Wight and Spithead onto the World Heritage list. In 2000 the University of the West of England commissioned her report on differing futures for historic naval bases across Europe. At the University of Portsmouth she taught the history of architecture and building conservation to craftspeople. She was Education Officer of the Civic Trust from 1989 to 1991. "From a SAVE point of view the focus on the UK was of great interest...it is an engaging read...and subject matter is of great significance."